With Halloween only one week away, the festivities around here have already started. The girls have already donned their costumes and headed out to multiple Halloween celebrations while still having a full week planned with more to come. As well as having to sort through a million and a half photos next week (yes, Mom, I'll send you some), something else I know I'll have to deal with is Big Sister E's constant requests for candy. I know that trick-or-treating is part of the tradition and a lot of fun in itself, but sometimes I wish that the aftermath could involve just a little less... sugar. 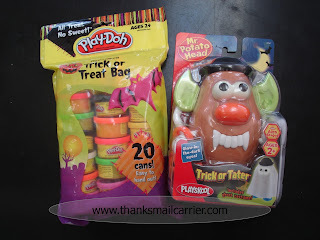 Fortunately, Hasbro has made it completely possible to enjoy the fun and excitement of Halloween without overdosing on sweets with their Play-Doh Trick or Treat Bag and Playskool Mr. Potato Head Trick or Tater. Containing 20 one-ounce cans of Play-Doh in assorted bright colors, the Play-Doh Trick or Treat Bag is a fun, affordable alternative to handing out candy (but not going quite as far as to being that house that gives out something like raisins or change... both of which I remember my parents doing when I was a kid). 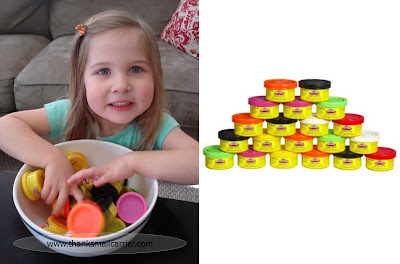 Retailing for $3.99 a bag, these cute little Play-Doh containers will still be providing entertainment long after the candy has been eaten (or taken away). This year instead of filling up a bowl with empty calories and sugar, why not hand out a fun toy that all kids love? Or, for another way to surely entertain while taking away some of the spookiness of the holiday, the Playskool Trick or Tater is a fun twist on the classic Mr. Potato Head figure that has been a hit for generations. Complete with glow-in-the-dark eyes (Big Sister E LOVES that they glow), shoes, ears, arms, nose, fangs, hat, pumpkin basket, hat and ghost costume (because even Mr. Potato Head gets into the fun of dressing up for Halloween), this is a great way to enjoy playing while subtly including learning about body parts and working on small motor skills. ...It's also pretty darn humorous to put one together in a mixed up, silly way as well. As with other Mr. Potato Head figures, we've had a great time moving and interchanging all of the pieces and having a good laugh over the results. Plus, I am always appreciative of the storage provided right inside the back so that anything not being used doesn't get misplaced or lost and my kids know right where to go to find a new pair of ears or set of eyes. Retailing for $7.99, this an all-around great surprise for kids of all ages! When kids think of Halloween, they think of costumes and they think of candy. But, thanks to Hasbro and their great alternatives, October 31 doesn't necessarily have to be overrun with an avalanche of edible treats. Instead, the Play-Doh Trick or Treat Bag and the Playskool Mr. 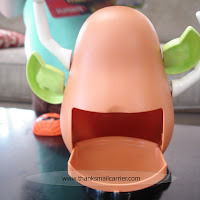 Potato Head Trick or Tater will provide fun the whole year through... and maybe help save you from an extra disapproving look from the dentist come November. I've been giving out wee containers of Play-dough as Hallowe'en treats for years now. Big hit with the neighbourhood kids. I'm amused to see them now packaging it specifically for Halloween giving. Some toys just never get old, do they? And the prices have stayed reasonable throughout the years! Oh he is cute! I love Mr. Potato Head. Told hubs if we were handing out candy I was getting Play-Doh instead.